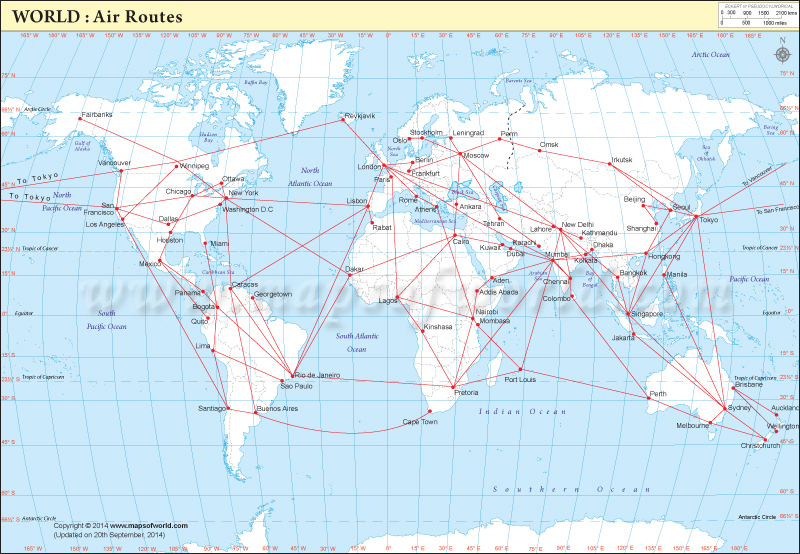 Description: Air route map shows the flight routes of the major cities of the world. Major World Air Routes Map shows a world map where all the major cities and the air routes connecting them have been shown. The cities shown on this map are Fairbanks, Buones Aires, Cape Town, Jakarta, Perth, Sydney, Melbourne, Perm, Omsk, Jakarta, Singapore, Bangkok, Seoul, Tokyo and Manila. These major air routes connect all the major cities such as Stockholm, Kuwait, Karachi, San Francisco, Los Angeles, New York, Stockholm, Zurich, Paris, London, Copenhagen, Vienna, Sydney, Tokyo, Nagoya and Osaka. There are various flight routes such as Washington D.C. to Tokyo, Los Angeles to Tokyo, San Francisco to Tokyo, New York/JFK to Tokyo, Paris to Tokyo etc. The world's biggest airlines that ply on these major world air routes are American Airlines, Delta Airlines, Southwest Airlines, United Airlines, Japan Airlines, Northwest Airlines, Duetsche Lufthansa, Air France, Air China, All Nippon Airways, Asiana Airlines, Austrian Airlines, China Airlines, El Al Airlines, Etihad Airways, Korean Air, Lufthansa, Scandinavian Airlines, Singapore Airlines etc. The Major World Air Routes Map shows that the world is a small place indeed.